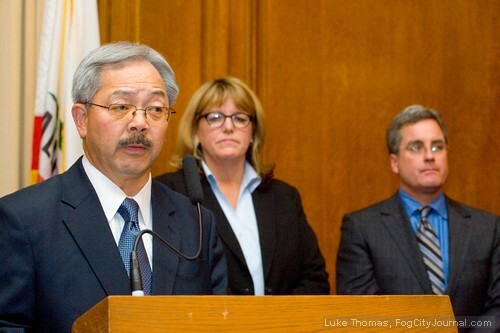 San Francisco Mayor Ed Lee announced yesterday the suspension of Sheriff Ross Mirkarimi, effective today, over his conviction of false imprisonment stemming from an alleged domestic violence incident involving his wife, Eliana Lopez, on New Year's Eve. 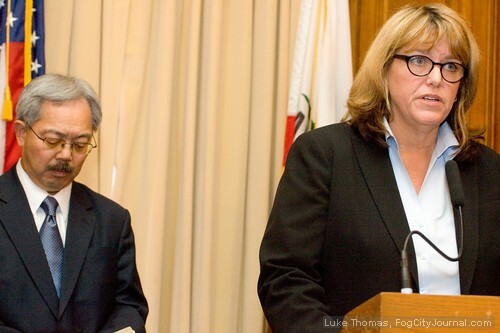 Lee named former Chief Deputy Sheriff Vicki Hennessy (center) to lead the Sheriff's department while Mirkarimi faces an Ethics probe and a vote by the Board of Supervisors. Photos by Luke Thomas. Barely two months into his first term of elected office and facing an early test of his leadership, San Francisco Mayor Ed Lee suspended Sheriff Ross Mirkarimi Tuesday for official misconduct following Mirkarimi’s misdemeanor conviction of a false imprisonment charge stemming from an alleged domestic violence incident involving his wife, Eliana Lopez, on New Year’s Eve. Lee, who had asked Mirkarimi to step down Monday or face suspension, announced his decision to suspend the Sheriff following Mirkarimi’s announcement that he would not resign. Mirkarimi now faces an Ethics Commission probe into whether his conviction rises to the level of official misconduct as defined in the city Charter, a finding that will be presented to the Board of Supervisors for a vote. Nine of eleven supervisors must vote in the affirmative to remove an elected public official from office. Lee named former Chief Deputy Sheriff Vicki Hennessy as interim Sheriff. Hennessy has been retired since 2011. As required by the Charter, Lee directed City Attorney Dennis Herrera to prepare documents officially charging Mirkarimi with official misconduct. Those documents will be delivered to Mirkarimi today. Mirkarimi, who racked up $125 thousand in legal bills while fighting three domestic violence charges in criminal court, will be suspended without pay. Mirkarimi is in the process of assembling a legal team for the upcoming Ethics Commission hearing, Fog City Journal can confirm. 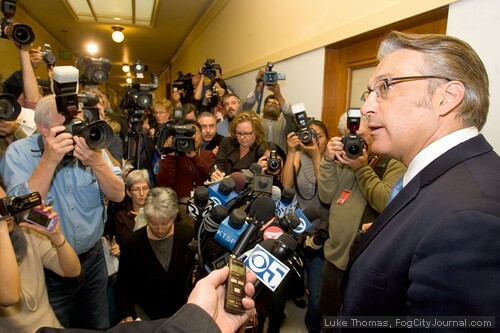 Sheriff Ross Mirkarimi announced he will not resign. 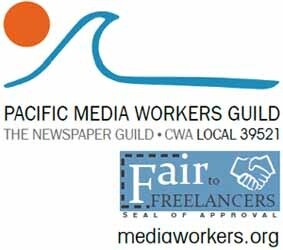 That story was expected to be told by Lopez at a noon press conference Monday. However, only Lopez’ attorney, Paula Canny, showed up. Canny said an op-ed article published by the San Francisco Chronicle, penned by the husband of Ivory Madison, Abraham Mertens, “Was a little disconcerting,” and led Lopez to conclude that she should not make a public statement. Madison, who documented on video a bruise on Lopez’ right arm on January 1, reported the New Year’s Eve incident to police January 4 without Lopez’ permission. The video was made at Madison’s urging, to be used, Madison said, in case Mirkarimi “got nasty in the divorce proceedings,” according to court documents. Court documents paint a picture of a couple experiencing marriage difficulties with concerns over a possible divorce and child custody battle. Canny said Lopez was always willing to testify in the trial if the prosecution would grant Lopez immunity. District Attorney George Gascón, when asked in February about the immunity request, said he was “confused” by the request, stating the prosecution had never intended to charge Lopez with a crime. Madison holds a law degree but is not licensed to practice law. “To say again that Eliana Lopez loves her husband and loves her child should go without saying,” Canny added. “Eliana Lopez is not afraid of Ross. Eliana Lopez supports Ross. Eliana Lopez supported the modification of the order that Ross could have visitation with Theo; that Ross is a good father; that Ross is a good man; that Ross is a good person. Eliana Lopez attorney Paula Canny. Meanwhile, outgoing San Francisco Democratic Party Chair, Aaron Peskin, called on Mirkarimi to resign. “For the residents of San Francisco, his ability to administer, manage and oversee the Sheriff’s Department has been compromised and his adherence to duty and the law has been undeniably marred,” Peskin wrote in a statement released yesterday. 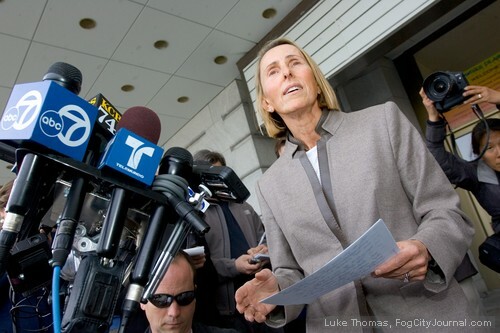 Domestic Violence Consortium Executive Director Beverly Upton, who led two press conferences calling on Mirkarimi to resign, stated she was satisfied with the Mayor’s handling of the situation and supported the selection of Hennessy as interim sheriff. Peskin Calls on Mirkarimi to Resign are now closed. I’m sure Bob is right that the City Attorney has told Ed Lee that he could go ahead. But I don’t think that would be the first time that he or the mayor made a mistake, if they did. Also, Bob, please note that “following the law” means following legal procedure, which, in this case, would require that 9 of 11 Supervisors vote to remove Ross Mirkarimi from elected office. Otherwise he stays. I didn’t hear anyone here say that “following the law is fascism.” I didn’t hear the word fascism till you used it, but maybe I missed a comment. You people are beyond ridiculous. Yeah the mayor is going to do undertake something so public without advisement from the city attorney – blatantly knowing its illegal – all because you dont know, but you THINK it might be illegal. He pleaded guilty, end of discussion. It does not matter whether or not previous officials were able to get away with it. Why is it always in SF that people think that following the law is considered fascism? Enough with the ridiculous needing to understand root causes and bleeding hearts. Ross abused his wife, abused his position in office, and now needs to go. Your point, Frank? He’s a law enforcement officer, or may be, and he attended the Police Academy. Such people tend to own guns. I haven’t heard of him packing them in public, as a Supervisor. In fact I think I remember a story about him getting in the line of fire, unarmed, to try to stop some gang fracas in District #5 one Juneteenth. As a member of the San Francisco board of supervisors, Mirkarimi fought against the NRA challenging San Francisco’s attempt to bolster gun control laws. This issue has caused many gun rights advocates to accuse Mirkarimi of hypocrisy, when it was reported that he himself was a gun owner even before he was elected Sheriff. He has since had to surrender his firearms due to the pending domestic violence allegations. And, David: I very much doubt that Ed Lee’s actions are legal, because the offense that Ross Mirkarimi pled guilty to was not committed “under color of office,” as, for example, Gavin Newsom’s were: http://legal-dictionary.thefreedictionary.com/Color+of+Office. I’m not a lawyer so of course I’m not sure, but it seems likely that Ross could win a lawsuit against the City for this if they fire him, assuming he could afford to fight it. The potential gains could be large enough to make a lawyer willing to take it on contingency. Any lawyers in this discussion? My guess is that Ross would rather resume as Sheriff. If what I hear is correct Ross is risking a lifetime pension and top level health care. Both kicked in when he hit 50 this year. In an irony, Daly won’t see a dime or have health care for another 12 years. The health care alone on the City’s Cadillac plan is worth over 600k over 30 years should Ross live to 80 and why shouldn’t he? If they offer to leave his pension/healthcare package alone he should resign, get back in shape and head another direction. Most of us oldsters have done that a few times. 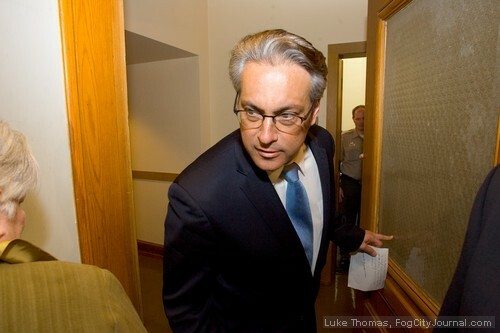 Here’s something I hadn’t realized about Ross Mirkarimi. His legislation created the Re-Entry Council: http://en.wikipedia.org/wiki/Ross_Mirkarimi#Reentry_Council. At his swearing in ceremony, he quoted Michele Alexander: “Incarceration is the new Jim Crow.” He’s been a champion of rehabilitative, rather than punitive and profitable criminal justice, and now he could become a model of the same. Those who prefer California’s prison industrial gulag, and world class incarceration rate would, I’m sure, like to see him fired. Correct me if I am wrong, but Sheriff Mirkirimi was elected by the people of San Francisco. Are the steps being taken to have an elected Sheriff removed from office by Mayor Lee, legal? So let me get this straight: Newsom, who slept with his best friend’s wife/subordinate and admitted to substance abuse while being mayor, nominates Ed Lee to be Interim Mayor, who in turn LIED to our faces and took advantage of incumbency to become our next fair mayor, then takes it upon himself to throw out a man who had a fight with his wife gone awry and who in fairness had anger management problems. We still don’t know what exactly happened in this fight. Allowing for Mirkarimi’s admitted temper which he is making amends for—and a bruise—we still don’t know if perhaps Lopez, feeling vengeful and fearful, exaggerated or distorted events in the video that she after the fact and understandably if this were the case, wanted destroyed. (Maybe, just maybe, this is why she wanted immunity). Were this the case, could it be that this “evidence”, this foundation to the whole case, might indeed be…flawed and unfair to begin with? In the end, I hope justice is served by the ethics committee and the board of supes. And I hope compassion and fairness rules in this fair city. Not “gotcha politics” and reactionary vengefulness. And one more thing I want to say to Anti Domestic Violence advocates: While it’s true that domestic violence is serious and not a private matter, I also want a more nuanced approach to judging someone to the point of banishing him from his work. I want San Francisco to be the compassionate city it is known to be. Not a vengeful one. Not a short-sighted fearful one, who in the name of Anti-Domestic Violence Advocacy loses sight of the very virtue these organizations seek to represent: nonviolence and compassion. And by nonviolence in this instance, I mean the kind of internal nonviolence of spirit whereby you choose not to hate your perceived adversary. No, even if one has committed a transgression, you still afford him dignity and a chance for redemption. And re Aaron Peskin: I believe that if anything, all that Ross is and will be doing in the name of making amends for his transgressions will make him more upright by the law. But let’s see what transpires in the Ethic Commission’s discovery. Because things were done improperly in the past to charge and remove public officials, elected or appointed, from office for wrongdoing SF should CONTINUE that same practice and pardon Mirkarimi for his actions? I don’t think so. The fact that he was charged and attempted to fight the charges (with attorneys he couldn’t afford and fund raisers had to be held to help offset the costs) and ultimately plea bargained and admitted guilt to a ‘lesser charge’ means he should just be embraced and left in office? Keep in mind HE IS ON PROBATION FOR3 YEARS… for false imprisonment, and he is the Chief Jailer for the City and County of San Francisco!! That means he will be on probation for basically the entire term of office… and that’s acceptable?? Let SF take baby steps forward to improving how they do what they do, and hold its officials accountable for their actions… beginning with Ross Mirkarimi. Actually Ann, the Newsom case is incredibly relevant, because she was his subordinate, and his actions toward her were a breach of ethics regardless of overt harassment. Newsom was a high public official with immense power, and when a workplace involvement takes place between such a powerful man and his subordinate, that is an inherent coercion of that subordinate, whether she experiences it that way or not. In a political office, these are strong grounds for an ethics action against that public official. And so, 5 years ago, then Mayor Newsom, went before the press, and admitted very publicly that he had substance abuse problems, and that he had committed adultery with, not only a close advisor’s wife, but more importantly, a woman who was an employed subordinate in the Mayor’s office itself. In that press announcement, Mayor Newsom, (just as did Sheriff Mirkarimi) admitted that he had problems and stated that he was seeking counseling and treatment to make himself a better person. And when Mayor Newsom sought to be allowed that path of redemption from the public and his fellow public officials, asking that he be given the chance to better himself and redeem himself, that is exactly the courtesy and wisdom that the public and the Board of Supervisors extended to him. As we all know, there was no move by the Board of Supervisors to remove Mayor Newsom from office. In the strikingly similar case of Sheriff Mirkarimi, a public official has stood up, taken clear responsibility for his actions, stated that he is seeking counseling and treatment to improve himself, and has asked to be allowed a path to redemption to become a better man. Just as with Mayor Newsom, we should wisely and compassionately offer Sheriff Mirkarimi the very same path to redemption. h. has laid out some of SF colorful history re. our prominent citizens and or elected officials. Why single out Mirkirimi this time when so many have been ignored.. Was what just happened to Mirkirimi an organized wich hunt ? If sp then I pose the question why? The superior/inferior issue is re sexual harassment. I don’t remember the mayor’s best friend’s wife accusing him of that. I think the use of company time, and the Mayor’s office, since he was the Mayor, would be the Ethics Commissionable issues. Like I said, no law against screwing your best friend’s wife. Thanks h. Do you remember when…….uh, what was I saying. Correct me if I’m wrong Annie but I think it is when it involves a ‘superior’ and an ‘inferior’. Never thought i would use the word ‘superior’ in connection with the Grease Monkey!! h – this is why Kamala Harris is totally unqualified to be a DA, or Attorney General. From your comments and the way the Mirikirimi situation played out, I would suspect that DA Gascon would have pursued these cases with more vigor than the darling of the progressives, Ms Harris. Also, just to be precise, I don’t think it’s against the law to screw your best friend’s wife in the Mayor’s office. But, the company time sounds like an Ethics Commissionable offense, moral turpitude under the color of the office. . . or was it the influence of cocaine? h. That’s enough institutional memory to deserve its own headline and byline, with pics’. Luke? Little input from an old man with institutional memory. When Joanne Hayes-White attacked her husband and battered him with a wine glass/beer mug/wine bottle (take your pick, all were reported) … in front of their children. Hubby calls 911 and tells them he fears for his life and is concerned for their children. Cops sent a female lieutenant to take the report and by the time it was completed the husband was saying that he’d actually assaulted himself. White remains the most ineffectual fire chief in California. White comes from a long time powerhouse Democrat family in the Sunset and her only qualifications for becoming fire chief was that she’d been a chauffeur for chiefs for years and then become a pencil pusher. She runs a department that fights a third the fires they responded to 30 years ago. Not only do they work less, she tossed the ambulances which do 90% of the responses out of the fire houses and downgraded qualifications to man them. She made us the ONLY county with a mutual aid agreement with LA to refuse to send even a single pumper truck South when they had those huge grass fires a couple of years back. She dismembered the arson investigative unit and drove out every member of the command staff whom she considered a threat. She refused to put adapters on SF fire plugs which have a different sized connections than any other in the country. She refused to live in the house SF built centrally for the Fire Chief after the 1906 quake. The City then gave the house rent free to the new head of the Planning Department who moved in with his lover who promptly tried to burn the place down after a spat and later killed himself. That’s John Rahaim and he’s still on the job. When Mohammed Nuru used his ex-con crew with the League of Urban Gardeners (SLUG) for political purposes ranging from intimidating voters at gatherings and later at the polls? Newsom promoted him. Dissolved SLUG but kept the worst of Nuru’s henchmen and forced out good DPW workers to keep the goons aboard. They used rigged weighted tests to fire good people. Entire thing was caught in BOS hearings. Nuru is probably the most feared City employee. For a time he was banned from attending meetings of senior staff at DPW because they were frightened of him. His neighbors said they pitied his wife and children because he terrorizes them. Now he’s head of DPW. Julius Turman’s ex-lover (Philip Horne) spent a couple of years on the Milk Club website and anywhere else he could get an audience telling them how Turman battered him. As a Newsom commissioner at another agency, Turman was reported by Larry Bush’s Citireports.com as having the worst attendance record of any other City appointee. Of course he was promoted to the Police Commission (his knowledge of domestic violence being a plus?) by Newsom and a BOS that was much more liberal than the present version. Of interest … Horne did a complete about face at the Turman confirmation hearings and told what a kind and thoughtful and gentle person Julius is. Do I need to go on? Newsom screwed his best friend’s wife in the Mayor’s office on company time and was handily re-elected. No one called for an investigation. In fact, the only officials I’ve seen dragged over the coals in the last couple of decades have been Progressives. And, Tony Hall. The systems rigged and run by corrupt politicians controlled by Downtown money. Y’all think we’ll see Hayes-White or Turman of Nuru called to defend themselves during the Mirkarimi hearing at Ethics? I have a better chance of winning the lottery and I don’t play. Giants in great shape except for Freddy Sanchez. That’s what I’d expect from Aaron Peskin, given the obvious source of the pressure behind this, but at least he’s no longer a voting member of the Board.